BACKGROUND: The risk of malignancy in patients with multinodular goitre (MNG) is approximately 7.2%. The gold standard for diagnosis of thyroid cancer is fine-needle aspiration biopsy (FNAB). Unsuccessful, inconclusive or suspicious results mandate further investigations. The concern is that with a benign FNAB result there is no indication for surgery unless the patient has compression symptoms or cosmetic issues, but the risk of missed malignancy is nevertheless present. OBJECTIVE: To determine the prevalence and histological features of incidental cancers in patients who had thyroidectomy for MNG. METHOD: Records of patients who underwent thyroidectomy between January 2005 and December 2010 at Chris Hani Baragwanath Academic Hospital, Johannesburg, South Africa, were retrospectively reviewed. Data retrieved included demographic characteristics of the patients, type of thyroidectomy, thyroid function test results, FNAB cytology and final histology results. RESULT: A total of 166 thyroidectomies were performed on 162 patients, the majority (139) of whom were females. The mean age was 46 years (range 15 - 79 years). A total of 120 pre-operative FNABs were available for analysis, 78 of which were suggestive of benign nodular goitre; 70 benign FNAB results were histologically confirmed to be MNG after thyroidectomy. Incidental malignancy was found in four of 70 cases of MNG (5.7%); all were papillary carcinomas, predominantly (75.0%) the follicular variant. CONCLUSION: The risk of missing cancer in patients with MNG was 5.7%. The commonest histological subtype of thyroid cancer found in MNG was papillary carcinoma. The current literature reports that FNAB was found to have missed malignancy in an average of 7.2% of cases (range 1 -13) when final histological results were obtained after thyroid-ectomy. [12,13] This is partly because the dominant nodule is not necessarily the one that is malignant, as even small non-palpable nodules can be malignant. [3,14] The concern is that follow-up may be recommended for patients who appear to have benign cytology, because they do not have other indications for thyroidectomy such as pressure symptoms or cosmetic reasons, and incidental cancers may be missed if a biopsy or lobectomy is not done. The most common thyroid cancer is papillary carcinoma (80%). Follicular carcinoma, while relatively rare worldwide, is reported to be more common in iodine-deficient areas where MNG is endemic and remains the most frequently diagnosed thyroid malignancy in blacks in South Africa and on the rest of the African continent[19-21] despite iodination of table salt since 1982. However, some thyroid cancers previously reported to be follicular were found to be papillary on histopathological review. [19,23] The diagnosis of differentiated thyroid cancer of follicular cell origin is currently based on the presence of nuclear features consistent with papillary carcinoma. We aimed to determine the incidence and histological features of incidental cancers in patients who underwent thyroidectomy for MNG (THY 2) (Table 1) at Chris Hani Baragwanath Academic Hospital (CHBAH), Johannesburg, South Africa. We audited the records of patients who underwent thyroidectomy at CHBAH between January 2005 and December 2010. Records included operating theatre entries, patient files and histopathology - reports at the South African National Health Laboratory Service. Patients were referred to surgery from medical endocrinology, from our cluster hospitals or directly to our surgical outpatient department, resulting in non-uniform work-up. In general, it is our policy to do thyroid function tests and ultrasound scans on all patients; those with hyperthyroidism are referred for a thyroid scan, and the rest (euthyroid and hypothyroid) will have FNAB. Our current surgical approach is to do either a total lobectomy or a total or near-total thyroidectomy, depending on the underlying pathology. Some patients may need debulking and tracheostomy to secure the airway (for anaplastic carcinoma). Papillary and medullary carcinomas necessitate lymph node dissection. Subtotal thyroidectomy is viewed as an inadequate procedure for both benign and malignant disease. Data collected comprised demographic information, thyroid function test results, FNAB results, types of thyroidectomy and post-thyroidectomy histological findings. A subgroup consistent with MNG on final histology was identified and the prevalence of missed malignancy with benign pre-operative FNAB was determined. Excluded from this subgroup analysis were all patients with unavailable FNAB results or FNAB findings other than benign goitre. Ethical approval for the study was obtained from the Human Ethics Committee of the University of the Witwatersrand, Johannesburg, and the Research Review Board of CHBAH. This was a descriptive study using means and proportions by ratio or percentage. Records of 166 operations performed on 162 patients were found. Demographic information for the patients who underwent thyroidectomy is set out in Table 2. Most of the patients were euthyroid (137/162; 84.6%), the hyperthyroid and hypothyroid cases representing 9.3% (15/162) and 6.2% (10/162), respectively. Total thyroidectomy and lobectomy represented the majority of the procedures (151/166; 91.0%), depending on whether the disease was bilobar or confined to one lobe. There were 74 total thyroidectomies, representing 44.6% of the procedures, and 77 lobectomies (46.4%). Other procedures were subtotal, near-total and completion thyroidectomy, debulking, and biopsy of a supraclavicular mass, with respective prevalences of 3.0% (5/166), 1.2% (2/166), 2.4% (4/166), 1.8% (3/166) and 0.6% (1/166). There were 15 additional procedures (three tracheostomies and 12 lymph node dissections). On final histological analysis, 66.0% (107/162) of the thyroidectomies were for MNG (including 11 toxic MNGs) and 21.6% (35/162) for thyroid cancer. The remaining 12.3% (20/162) were performed for other reasons (adenoma, Hashimoto's thyroiditis and Graves' disease). The commonest cancer was papillary carcinoma (27/36; 75.0%) (Table 3). Of note, one patient had dual pathologies (follicular and papillary carcinoma). A total of 120 pre-operative FNAB results were available for comparison. Records of the remaining 42 FNABs were missing (20/42), or the procedure had not been done (10/42) or was unsuccessful (12/42). On cytological analysis, 78 of the 120 FNABs (65.0%) suggested benign nodular goitre (Fig. 1). Incidental malignancy was found in four of 70 cases of MNG (5.7%). 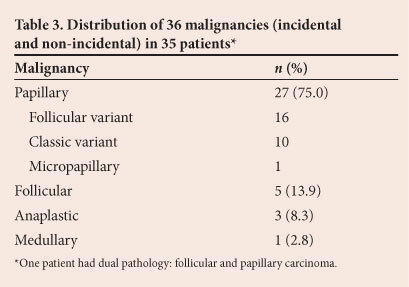 All the malignancies were papillary carcinomas, with the predominant histological subtype being the follicular variant (75.0%) (Table 4). 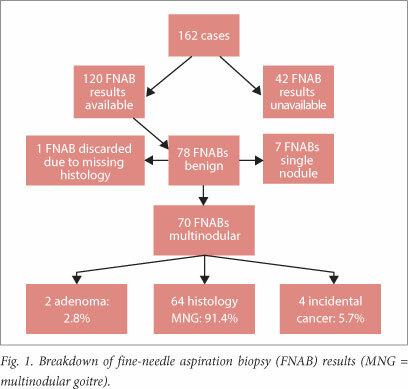 Among all the malignancies (incidental and non-incidental) there were 27 papillary carcinomas, for 24 of which FNABs were available (in two cases FNAB was not done and in one case a biopsy specimen was obtained from a supraclavicular mass); 11 of these 24 cancers were diagnosed on FNAB, and there were three unsuccessful procedures and 10 other findings (four cases each of benign goitre and atypical cells, one Hurthle cell lesion and one follicular tumour). Of the three anaplastic carcinomas, two were confirmed on FNAB and the third was labelled a follicular tumour. The single case of medullary carcinoma was confirmed on FNAB. For the five follicular carcinomas, the two available FNABs reported atypical cells and a Hurthle cell lesion; in two other cases FNAB was not done, and in one case a biopsy specimen was obtained during thoracic spine surgery. The histological subtypes of incidental cancers in our patients mirrored findings in patients who presented with overt disease. All the incidental cancers were papillary carcinomas, predominantly the follicular variant. This is in contrast with Rumstadt et al. 'sreport that all incidental cancers in their patients with MNG were true follicular carcinomas. The incidental cancers in our patients were larger than 4 cm in diameter and therefore prognostically significant. Our results echoed the findings of Pisanu et al., who reported similarly large incidental cancers in patients undergoing thyroidectomy for benign goitre. Three-quarters of thyroid cancers operated on at our hospital were papillary carcinomas. Only 13.8% of thyroid cancers in our study were follicular carcinomas, which is significantly lower than figures reported from other tertiary hospitals that treat mainly black South Africans. Mulaudzi et al. reported a significantly higher rate of follicular carcinoma (68%) than papillary carcinoma (16%) in black patients with thyroid cancer at King Edward VIII Hospital in Durban. The 5.7% prevalence of missed malignancy in this study is within the range reported previously. Figures in the literature range from 0.7% to 13%, with an average of 7.2%. [12,13] The availability of ultrasound-guided FNAB, the limitations of cytology, the cytologist's expertise and the iodine status of the environment are factors that probably explain the worldwide difference in incidence. FNAB preceded thyroidectomy in the majority of our patients (120/162) and was accurate in the diagnosis of MNG (91.4%). It did not diagnose all the 35 cancers pre-operatively, but all the FNAB reports of malignant disease were confirmed on final histological examination. The sensitivity of FNAB in diagnosing papillary carcinoma was only 45.8% (11/24). 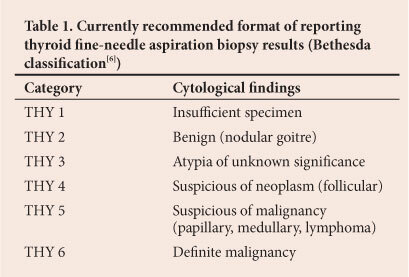 Nevertheless, even in the case of histologically confirmed cancer not diagnosed by FNA, the patient will still be eligible for diagnostic lobectomy because according to the Bethesda classification (Table 1) all categories require surgery except for THY2 (clearly benign disease). Our 5.7% false-negative rate for FNAB in detecting cancer is similar to the findings of Rumstadt et al. (false-negative rate 6%) in their retrospective audit of MNG post thyroidectomy. The incidental cancer rate in our study was far lower than the rates in benign thyroid disease reported by Bradly et al. The following shortcomings should be noted. Only patients who had thyroidectomy were included in the study, so our findings may not reflect the true incidence of thyroid cancer in our region. Many patients with smaller nodules are managed non-surgically by endocrinologists. However, it is likely that their inclusion would have reduced the incidence of thyroid cancer, because patients who are not referred for surgery generally have small nodules that are not unsightly and do not cause pressure symptoms. Although these smaller nodules (<4 cm) can still be malignant, the prevalence of malignancy is lower than in larger nodules (1.3% v.4.3%). We had no access to information on how the FNABs in patients with clinical features of MNG were done. It is highly unlikely that ultrasound guidance was used, which could explain why the pre-operative FNABs missed malignancy in all four cases of incidental cancer with large tumours almost replacing the entire lobe. It is also possible that the FNABs may have sampled the area of intra-tumoural necrosis. Ultrasound-guided FNAB is likely to avoid these problems. Three of the four patients with incidental cancer had an inadequate procedure. Had the presence of cancer been known pre-operatively, they would have had total thyroidectomies. Age is important in the prognosis of differentiated thyroid malignancy of follicular origin. In patients of favourable age (<40 years for males and <45 years for females), there are only two stages, stage I and II (stage III and IV behaving the same as stage II). Interestingly, all our patients with incidental cancers were female, aged <45 years, and fell into the low-risk group. However, the sample is small and statistical power is low. The mean age of the four patients with incidental cancers was 30.25 years, v. 50 years in the 31 patients with non-incidental cancers. Incidental cancers accounted for 11.4% (4/35) of all cancers in our study. We had few cases of hyperthyroidism. Of note, there was only one case of Graves' disease; this particular patient had a huge goitre (560 g) with pressure symptoms (dysphagia and dyspnoea) that required total thyroidectomy. Our figures are likely to be biased, because in our institution most of these cases are treated medically with antithyroid medication followed by radioactive iodine. The majority of cases of hyperthyroidism were toxic MNGs (11 cases) with two cases of toxic adenoma and one malignancy (follicular carcinoma). It is our policy not to perform FNAB on hyperthyroid patients, as the FNAB finding in that context can mimic malignancy. Cosmetic concerns play an important role in decision making. Our impression is that many patients feel uncomfortable about keeping their goitre, even if it is small and benign, and request surgery. The fact that so many patients with benign FNAB undergo surgery will reduce the incidence of missed malignancy. Furthermore, patients with pressure symptoms qualify for surgery irrespective of the FNAB finding. The risk of incidental cancer in patients with MNG undergoing thyroidectomy was 5.7%, and the commonest histological subtype was papillary carcinoma, mainly the follicular variant. Patients, especially those at relatively high risk, should be made aware that there is a slight risk of missing malignancy. The use of ultrasound-guided FNAB is likely to lower this risk.